The reason I checked out The Murder Of My Sweet when they released their debut album Divinity in 2009 was that I friend of mine, ex-Therion and current Evergrey bass player Johan Niemann had joined the group and I was curious to hear what his new project sounded like. Despite the fact that the world has been drowning in Goth-influenced Metal bands with female vocalists after the success of Nightwish, Within Temptation and Evanescence, I really thought that it was in its place for a Swedish dito as we really never had none. Singer Angelica Rylin proved to be a real find with an amazing voice and – thank God – not as annoying as many of the Tarja Turunen – influenced operatic singers. Rylin sported more of a Pop voice in a Rock foundation, but with an incredible range. I really liked the record, but I now see it had some issues – the songs were good, but the way I find them, they weren’t lasting, there was no longevity. What I mean is that the songs are really good while I’m listening to them, but I really had no desire to go back and pick the album up again. However, I wouldn’t label the band Goth – fact is, I’m not really sure how to label them, but one moniker that has been used is Cinematic Metal, a term I think fits well. See, TMOMS’s records, their debut and the follow-up Bye Bye Lullaby (2012, reviewed here) both make you feel like you’re watching a movie because both albums are theme albums, or concept records, if you will, but they sound more like soundtracks – like you’re actually in a movie – than other concept records like say, Operation: Mindcrime (Queensrÿche), Seventh Son Of A Seventh Son (Iron Maiden) or Music From The Elder (Kiss). Bye Bye Lullaby had the same issues as Divinity, great while listening, but the need to pick the album again really wasn’t there. When Rylin released her debut solo album Thrive (2013, reviewed here), I actually thought that this was the route she would choose in the future and that TMOMS were no more. I always thought that TMOMS felt more like a project than a band anyway and the fact that Rylin has a voice that was made for AOR and Melodic Rock, the deal was done, I guessed. 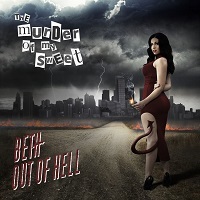 But my guess was wrong and now drummer / producer / song writer Daniel Flores and his gang has served us with a third portion of what we now must call Cinematic Metal – Beth Out Of Hell. As always, we get a movie in songs from this lot and according to Rylin, the story here, where Lucifer’s daughter, that would be Beth, falls in love with archangel Michael, an apocalyptic love story in other words that actually started with the three last song off Bye Bye Lullaby. That would be “Waiting For The 27th”, “Black September” and “Phantom Pain”. This time, I was hoping that not only would TMOMS make a really good album, but also one that would last. The fact that I haven’t had any desire to pick up the previous two even though I like them is a bit worrying, to be honest. So let’s see what they have been up to the last few years then. “Hell On Earth” is an intro, very atmospheric and the word “cinematic” describes this piece very well and it gives you a hunch on what to come. “The Awakening” kicks in next and this is kind of tune I have been waiting for from this band – symphonic, melodic and a bit on the gothic side with an amazing chorus, catchy as Hell (sic) – yes, baby! “World In Ashes” take us into Metal territory, albeit with an in-your-face chorus and some symphonic and gothic undertones. It make me think of a Heavy Metal musical – Movie Metal, if you like. “Always The Fugitive” holds a huge, epic and symphonic arrangement with a brilliant chorus that gives this AOR-pearl big hit potential – release this as a single immediately! “Bitter Love” is the album’s grand ballad that later turns into some kind of Hard Rock musical, very bombastic indeed. Rylin here share lead vocal duties with Daniel Flores who holds the part of archangel Michael – Flores really has a good voice. “Still” on the other hand is a more straight forward Melodic Hard Rock tune with AOR influences. It holds a catchy uptempo beat, but it is still a pompous track – and it is a killer! We get more in the straight forward Hard Rock vein with “The Humble Servant”. The song has a really striking and catchy chorus and I would think of this as a single as well. Next up, a nine and a half-minute musical journey called “Requiem For A Ghost”. Now, those over-blown and big songs run a risk of being just a bit pretentious and therefore leave the listener pressing the fast-forward button if you’re not careful. But do it right and you’re in for a treat – a delight. TMOMS did it right! The song is a Rock Opera in itself – huge, epic, dark, heavy, but still so very melodic and catchy. Yes, I’m thinking of Nightwish’s brilliant moments here, but this is so much more than just another copycat clone – this is an amazing piece. It’s a also a strike of brilliance to follow that song with something completely different: “Euthanasia” is a heavy Metal track that has its foundation in modern radio rock, but at the same time it has an AOR-ish melody and refrain – dark, but poppy. Awesome! “Tide After Tide” also takes me to Nightwish-land a bit, but not the big and pompous stuff, no I’m talking about some of their later songs here. Still not a clone by any means, this tune has this wonderful jazzy, lounge music vibe and I can picture the gorgeous miss Rylin in a fancy dress, sitting in a smoky 1920’s club singing this one – fantastic! “Poets By Default” is a heavy Pop song with Rock and musical influences. The tune is not as direct as the other tunes here, but it’s still very much – a bit of a grower, actually. “Heaven Succumb” is really the record’s sore thumb. It’s a hard rocker on a blues foundation – not that far removed from Vinnie Vincent Invasion’s “Back On The Streets” (yes, yes, John Norum also did a version of that song, I know…) actually. That said, it’s this record’s most forgettable moment. If you thought that a nine and a half-minute track was the biggest thing on this album, say hello to closing track “Means To An End”. 11.04! That song is the sum of the this whole album, both musically and lyrically. It’s big, bombastic, pompous, Metal, AOR and it really ties the whole story together – and those 11 minutes flies by in no time. I must say I’m impressed. Very impressed. Although this album has a running time of 75 minutes, it really doesn’t seem that way. All the songs are intriguing and interesting and they leave no space for even thinking about anything else while listening. So what’s the difference between this record and its predecessors then? It’s hard to pinpoint, really, but I think it’s just as simple as this time the tunes worked better for me – others might just disagree. But to me the songs has more depth and this time nothing is left for chance. Also, when done right, I have a weak spot for this whole Rock Opera / Rock musical thing, where instead of space between songs, there’s narration which add dynamics to the story. I catch myself thinking about Dreams In The Witch House (2013, reviewed here), not that the story is the same, but the concept of doing stuff. The whole project is big, the sound is awesome and all the players – that also include Christopher Vetter on guitar and Patrik Jansson on bass – are all killers. And then we have Angelica Rylin. The woman has a stunning voice, not at all a big Opera voice like many of the other female vocalists around in Metal, but more of a Pop and Rock voice with lots of soul. Another big improvement is her pronunciation. On the two first records, Rylin’s English left quite the lot to be desired, but apparently work has been done in that department and the Swenglish bits are now gone. I’m not sure if there is any chance in getting a big break when you play this kind of over-blown – in a good way – and bombastic music, but in TMOMS’s case, it shouldn’t really be a problem because with this album they have everything going for them and this time, the songs will last, at least for me. The fact that miss Rylin happen to be a real beauty probably won’t hold back the band’s success either. They say third time’s the charm – so here is TMOMS’s charm. Go get it!